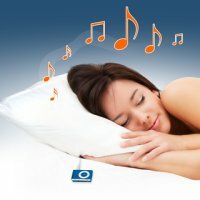 Need to listen to some music before you can actually fall asleep? That’s not a problem if you happen to be single, but what if you’re married to someone who needs absolute peace and quiet before he/she nods off? Enter the Sound Asleep Pillow that could’ve easily been invented by Edison. Ideal for headphone haters, telly addicts, insomniacs and anyone who enjoys dozing off to a few gentle Napalm Death lullabies, this wonderfully squishy pillow has a built-in speaker that can only be heard by the layabout with their noggin plonked on it. Simply plug your music source (iPod, radio, TV out) into the pillow’s 3.5mm stereo socket and you’re away. Bedmates will be none the wiser (unless you start singing along and drumming on the mattress). You can choose from original or memory foam types which retail for £17.99 and £29.99, respectively. Sounds like magic, and probably is!